The present book contains papers presented at the seminar on Madhyamika school of Buddhism held at Drepung Monastic University Mundgod, Karnataka in 1989. The book also in cludes Prof. Alex Wayman’s paper which was not presented at the seminar because it is also on the same subject. 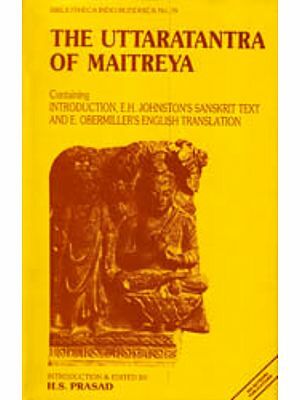 The papers included in the book are the Development of Madhyamika Philosophy in Tibet by Thupten Chhogdup; The four theses of negation of Prasangika Madhyamika by Geshe Palden Dragpa; The four Affirmative theses of Prasangika Madhyamika by Geshe Teshe Thapkhe; philosophy of Madhyamika & Other schools of Indian philosophy by Raghunath Giri and the Secret of Nagarjuna’s position of Dependent origination and Sunyata by Alex Wayman. It gives us a great pleasure to bring out the papers presented in the third Monastic Dialogue Seminar on Madhyamika School of Buddhism held at drepung Monastic University, Mundgod, Karnataka State in 1989 in the Sambhota Series Publication of Tibet house. This volume does not carry the papers presented in Hindi for the translated version did not materialize on time hence the delay in publication of the materials. Although it is not a part of the Dialogue Seminar proceedings Prof. Alex Wayman’s paper which was delivered at Tibet House at the Indo-Tibetan Art & Culture Study Group lecture in July 1994 is included for the reason of this being on the same subject. With the inspiration we have received from his holiness the Dalai Lama we have been trying out best to promote Buddhist studies in general and particularly these dialogues between the traditional Tibetan Scholars and Indian scholars from various Academic institutions. It is his Holiness firm belief that such dialogue are vital to maintain constant contact between the two sections of scholars in order to promote Buddhist studies. It is our hope that by understanding each other’s approaches and method the scholars would be better equipped to work towards a confluence of ideas. This small volume is a result of that effort. I would like to thank Mr. Adil Tayyabji for his excellent editing and Geshe Tenzin Sherab for surveying the manuscripts of this volume.